The blessing of the animals: why? Blessings of the animals have become a tradition in many churches. A generation of young adults has grown up with them. And yet this tradition is relatively new. It does have some earlier antecedents, but in its current form, and as a Protestant practice, it’s only thirty years old or so. I’ve wondered why it caught on so quickly, why Protestants find it a good idea, and what kind of “cultural work” it does. Here is a short column that considers these questions. For more, see the book, of course. 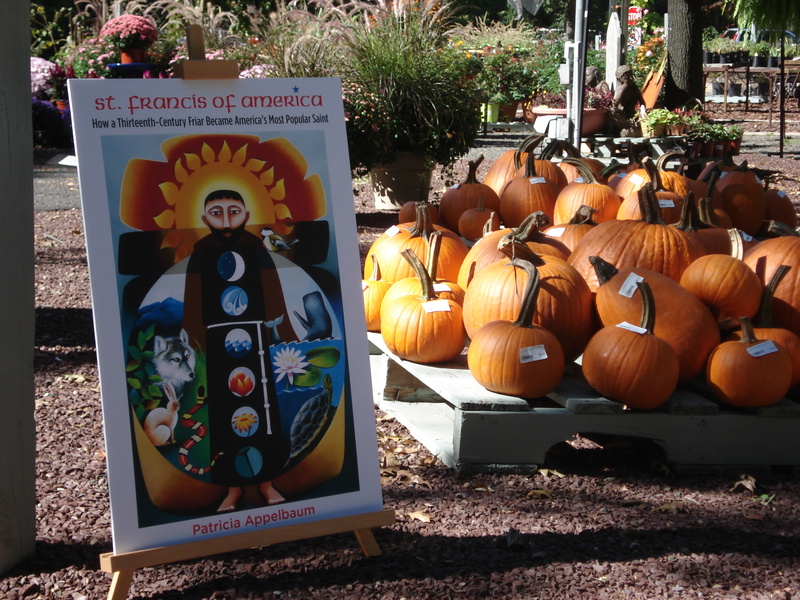 St. Francis is often sighted in garden centers, so I thought it would be a good idea to have a book signing at one of them. My friend who owns a New Jersey garden center, Perennial Favorites, agreed. It was a beautiful day and we had a great crowd. St. Francis garden statuary is largely a creation of the twentieth century, born of a historical matrix of landscape, housing patterns, spirituality, garden design, art, wealth, and social concerns. While it’s easy to dismiss garden statuary as a cliché, my research indicates that it has much deeper and more diverse meanings. It can be an expression of intention, a wish or a hope, an opening into a wider world, or a focal point for quiet meditation – itself a countercultural act in our increasingly noisy and hurried society. And for many people, as my friend pointed out, the garden statue is simply a reminder of a favorite spiritual hero or a person who was attuned to nature. “Never Mind the Pope; What Would St. Francis Do?” Read about it here. As I reflect on the recent visit of Pope Francis to the United States – already vastly publicized and widely discussed – I wonder where Saint Francis was sighted. When Pope Francis chose his name, the eminent Catholic theologian Hans Küng wrote in the National Catholic Reporter that no previous pope had “dared to take the name of Francis” (italics mine). I’ve thought about this myself in the past — the fact that the name of this beloved figure is so conspicuously missing from the papal rolls. But it’s not really surprising. The name implies a very high standard: absolute poverty, cold and hunger, exposure to disease. What Pope would sleep in a stable or a ruined church, get his food by begging, and spend his days hanging out with lepers and preaching in the streets? 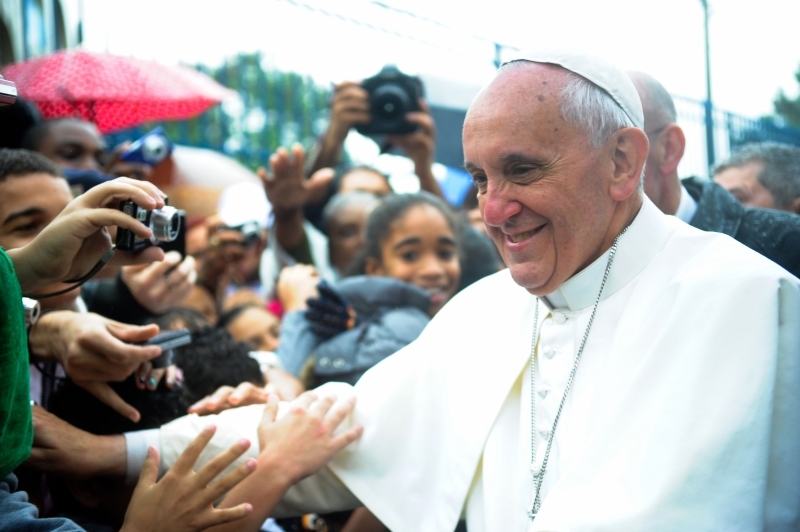 To be Francis is to turn away from any kind of predictable life or institutional support. You can’t really be a Pope that way. You might be the head of a church, if you could get people to follow you, but you wouldn’t be an administrator or a head of state or an international spokesman. You wouldn’t direct a bank or a group of museums. There is, of course, the example of the Third Order. Like Third Order Franciscans, a pope could be someone who lives “in the world,” but who lives simply and serves others, and who engages in a regular life of prayer and spiritual devotion. Then, too, life in the other Franciscan orders has evolved toward a more stable pattern since the time of their founder. But Pope Francis doesn’t belong formally to any of these communities. What he has done is to move the needle. Pope Francis doesn’t pretend to be imitating Francis of Assisi in every particular. But in many of the things he does, he moves one step closer to St. Francis’s example, and he does it publicly and conspicuously. Pope Francis still uses a car, but he downsizes it. He still wears clean clothes, but they’re simpler. He speaks to the United Nations, but he also, as we all know, goes to the prisoners and the people in shelters and the children. In a way, he does what a lot of us do. I’ve often been bemused by the ambivalence of people’s reactions to Francis of Assisi. Of the many people who love and admire him, very few really do give everything up to follow him. Nor do I think that’s strictly necessary – I’ve reflected on this question at some length in the book. On the other hand, I also don’t think admirers of Francis should willfully ignore his difficult side and the challenges he presents. Most of us fall into the realm of compromise. A person who admires Francis as an early environmentalist, for example, is probably also recycling and composting, and maybe wearing secondhand clothing or doing a little lobbying, even if he/she has to say “Well, yes, I do still heat my house in the winter.” A person who admires Francis’s poverty might be an anti-capitalist politician or an underpaid social worker, but might resist living on the streets. In the course of my research, I found a lot of historical figures who walked consciously in that middle ground, such as Vida Scudder and Laurence Housman. Many others walked it unconsciously and unintentionally. Pope Francis, it seems to me, does it intentionally. He accepts the office of the papacy, but he doesn’t accept the way it’s always been done, or the way it’s been done recently. In this way he offers hope to those who are not radicals, and, at the same time, a reproof to those who might like to shrug and say there’s nothing we can do. Granted, we always need purists and absolutists to show us the way. But it’s also useful to think that we ordinary sinners can do something, even if we can’t or won’t do everything. It’s the season for blessings of the animals – the time around the feast day of St. Francis, October 4. This is largely a Protestant tradition, and Protestants these days are holding other blessing services as well, for bicycles, backpacks, chainsaws and more. But when did Protestants start blessing things? And why?